Context: Read this when we moved into a lovely house in Piddington. My aunt-in-law packaged this one up for me for Christmas thinking I’d like to read it. She was right. And she was also right to buy it for me as it’s unlikely to be one I’d buy for myself. It was worth a read if only to give insight into the new President of the USA. But there was a little bit more to it than that. It wasn’t a great read, I’ll admit. He was pretty young when he wrote it and it tends to the verbose. This verbosity is really just an overflow of his musings on race, his own identity, his family, inequality and power, and he returns to these in lengthy passages that hold together brief bits of activity. This does though, reveal a lot of his struggles and therefore presents a frank and honest insight into what has made him the man he is. I’ve read a number of the authors that he credits with raising the race issue in American literature: Baldwin and Ellison among them. But, despite having read and appreciated them, one thing that Obama taught me that the others didn’t was how deeply this issue overwhelms the black US community. This was a good insight for me. On the whole though, apart from these valuable insights into what it is like to grow up black in a white culture, there wasn’t much else to hold my attention apart from the fact that throughout, you’re reading it thinking ‘This guy will be President one day.’ and chuckling at the way people treat him who were not party to this knowledge at the time. Amazing. 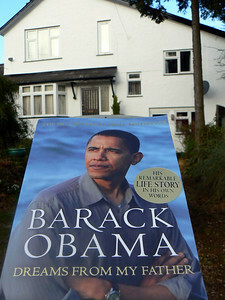 It’s fairly well written (better than I expected), dividing into sections on his Hawaiian childhood, community work in Chicago which got him on the socio-political bandwagon and taught him harsh lessons about working from the grassroots level up and a final section on his first visit to family in Kenya. If he does a better job of being President than he does at writing, he’ll be a very good one. A few months after my twenty-first birthday a stranger called to give me the news. [the law is] glorified accounting that serves to regulate the affrirs of those who have power – and that all too often seeks to explain, to those who do not, the ultimate wisdom and justness of their condition. But that’s not all the law is. The law is also memory; the law also records a long-running conversation a nation arguing with its conscience. And for that moment at least, I felt like the luckiest man alive. My first thought when I saw this book was that Obama could not have written it. I was wrong, but only because I did not have all the facts. Potential readers should understand that this book was published in 1995 when Obama became the president of the Harvard Law Review – NOT the President of America. Of course that doesn’t detract from the facts in the book but some may want to wait for an updated edition after Obama’s two terms of office. Now that may be a book you’d want to read. Just recently, i bought this book and start reading it. I couldn’t put it down just when I start reading. You must grab a copy guys. He’s really amazing.